A new book published in the Platform for Independent Journalism (P24) Media Library series seeks to shed light on a rarely discussed issue in the beleaguered Turkish media: self-regulation. The book was launched at a conference, organized on 5 December 2018 at Adahan Hotel in Istanbul in the form of a roundtable meeting. Participants included Maria Kanellopoulou, the head of Press, Information and Communication Section at the Delegation of the European Union to Turkey in Ankara, Adeline Hulin, project officer for Freedom of Expression and Media Development at UNESCO Brussels Office, representatives from the Press Council, authors of the book, academics and journalists. The meeting began with presentations of seven chapters of the book by their authors and their recommendations to improve self-regulation in their area of research. It then continued with a discussion among participants on the current state of media-self regulation, how the situation is exacerbated by the deteriorating media freedom situation and how self-regulation and media freedom are intertwined, and what steps can be taken to improve media self-regulation in Turkey in the light of the book’s findings. 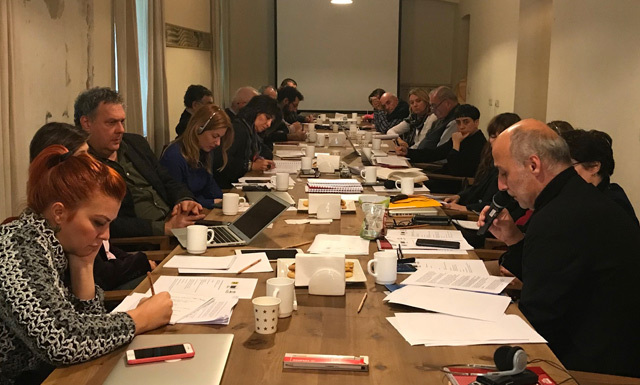 Among the participants were seasoned journalists Hasan Cemal, who is also the founding president of P24, Zeynel Lüle, Tayfun Ertan, Ferhat Boratav and journalist and documentary maker Ümit Kıvanç. The chapters were penned by Doğan Akın, editor-in-chief of T24 website, Suncem Koçer of Kadir Has University, Press Council Vice President Murat Önok, Ceren Sözeri of Galatasaray University, journalist Tuğba Tekerek, Professor Aslı Tunç of Bilgi University and Sarphan Uzunoğlu from UiT The Arctic University of Norway. Doğan Akın discusses self-regulation in Internet media in the book, identifying key problematic practices and offering a set of recommendations on how to introduce and implement ethical norms in Internet, while Suncem Koçer focuses on self-regulation in television, and particularly the role of RTÜK, Turkey’s radio and television broadcasting watchdog. Murat Önok explains the structure and functioning of the Press Council while also addressing criticism towards Turkey’s one of the oldest and most prominent self-regulatory body. Ceren Sözeri gives a detailed account of evolution of media ethics in Turkey and identifies key obstabcles standing in the way of having a functioning media self-regulation system while Tuğba Tekerek focuses, through in-depth interviews with ombudspersons of Sabah, Milliyet, Hürriyet and Cumhuriyet newspapers, on ombudsman mechanism in the Turkish media. Aslı Tunç, in an effort to “point the compass in the right direction,” takes a closer look at self-regulation models from around the world and Sarphan Uzunoğlu discusses self-regulation at the age of new media, social media platforms and fake news. The book also includes an editors’ introduction penned by Yasemin Çongar, Fatma Demirelli and Seçil Epik on the current state of the media in Turkey, legal understructure of self-regulation and recommendations for the way forward.